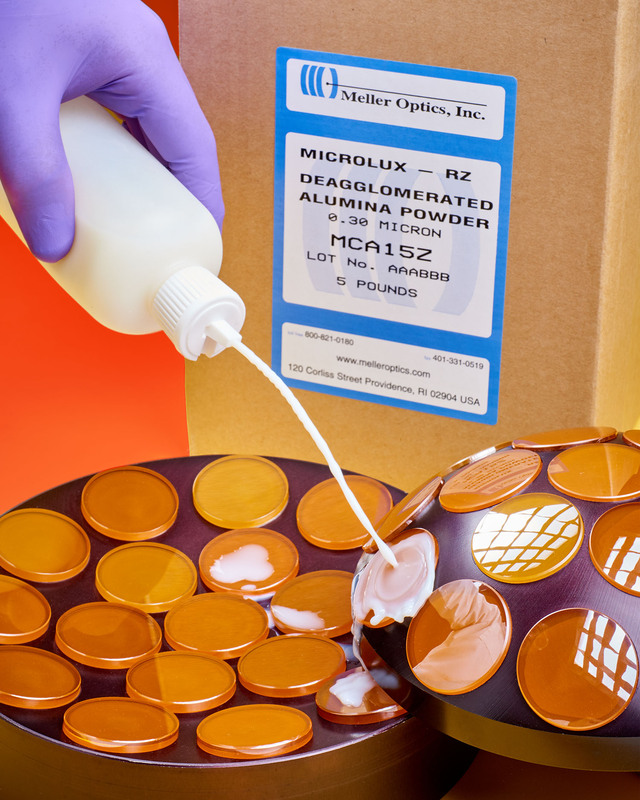 A line of high-purity calcined alumina polishing powders that can be mixed into slurries and applied to a spot block as parts are being oscillated is available from Meller Optics, Inc. of Providence, Rhode Island. Meller Microlux Alumina Powders are ready to mix with de-ionized water and are offered in two grades and seven particle sizes from 0.05 to 3.0 microns. Ideally suited for application directly to optics on spot blocks, they are capable of producing surface finishes to 10-5 scratch-dig on a wide range of hard and soft materials including ZnSe, germanium, and silicon. Meller Microlux Alumina Powders are offered in a Microlux-R version which features large agglomerated particles for aggressive grinding and lapping that break down under pressure for final polishing and are 99.98% pure. For fine grinding and uniform polishing, they offer a Microlux-RZ version with 99.99% pure de-agglomerated powders and controlled particle sizes. Meller Microlux Alumina Powders are priced from $46.60 to $95.00 per lb., depending upon grade, particle size, and quantity. Free samples and price quotations are available upon request.